An OUI is a 24-bit globally unique assigned number. An OUI is assigned with a MA-L identifier block and is referenced by various standards. It can be used to identify an organization or company which requires a globally unique identifier. The OUI is usually linked to other bits that are assigned by an organization, and together they make a globally unique EUI‌-48 or EUI‌-64. 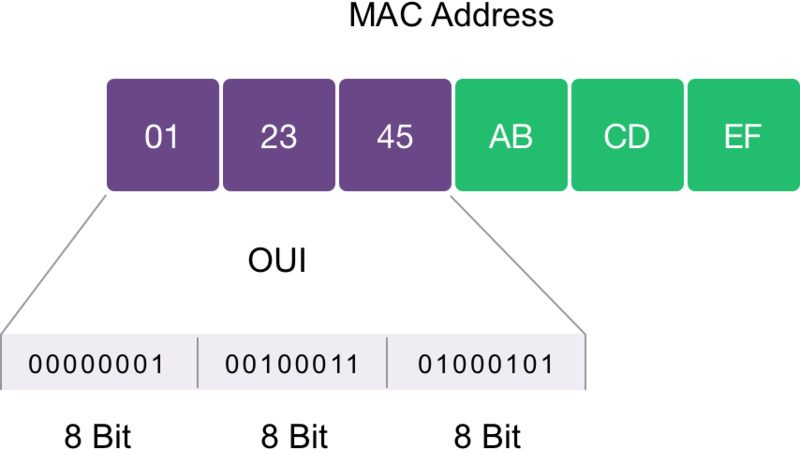 EUI‌-48 and EUI‌-64 may be used as universally unique MAC addresses, as is the case in the family of IEEE 802® standards. For example, the Ethernet MAC Address is an EUI‌-48 unique to one particular Ethernet interface. However, there are other uses of the OUI, like as a company identifier in the SNAP protocol. How to recognise an IANA MAC address application?